When you’re trying to eat healthier, meal prep can make it easier to stick to your plan — just cook a big batch of nutritious food at the beginning of the week, and you’ll always have a healthy meal ready when you get hungry. But eating the same few foods, day after day, can get old pretty quickly. And once you feel like you’re stuck in a salmon-and-steamed-broccoli rut, you may lose interest in meal prep altogether. “If you get bored with what you’re eating, sooner or later you’ll give up,” says Benjamin L. White, Ph.D., MPH, RD, LDN, a registered dietitian at the weight-loss center Structure House. Here’s how you can keep meal-prep burnout from getting in the way of your healthy eating plan. 1. Think streamlined, not boring. “Very few people want to spend a lot of time thinking about — or preparing — every meal, every day,” Dr. White says. “Having some simple, quick building blocks for meals can be really help.” And just because you cook a pound of chickpeas on Monday, for example, it doesn’t mean you have to eat plain chickpeas every day — you can make chickpea curry on Tuesday, chickpea burgers on Wednesday, homemade hummus on Thursday, and roasted chickpeas on Friday. 2. Add color to your meal prep. Picture a plain chicken breast on a bed of brown rice. Drooling yet? No? We don’t want to hate on beige — plenty of important staples come in blah colors — but let’s be honest, bright colors just make a meal more enticing. (You’ve probably heard the saying “eat the rainbow.”) When you’re grocery shopping, add more color to your meal prep with brightly colored produce like red berries; yellow peppers; dark, leafy greens; and purple onions. Even carbs can be colorful — try sweet potatoes, yellow corn, or purple yams instead of the usual grains. 3. Stop overcooking your food. Avoid the most common cooking mistakes. Brush up on basic cooking terms so you won’t feel intimidated by new recipes. Learn to bake a chicken breast the right way — no more dry, chewy meat. 4. Use your freezer wisely. 5. Try a new recipe every week. Obviously you’re going to have a few standbys you rely on every week — hello, Taco Tuesday! — but try to incorporate one new recipe each week to keep from getting burnt out on your go-to foods. Switch up your daily smoothie, try a new one-pot meal, or make over a favorite meal with a new flavor — like swapping out your Southwestern black bean salad for a tangy white bean salad (or vice versa). 6. Switch up your fruits and veggies. Research suggests eating a variety of veggies may help you squeeze more veggies into your diet than simply sticking to your tried-and-true faves. In one study, participants were given half a plate of veggies — either a blend of veggies or just their favorite. The group who got the variety consumed more veggies overall than the group who got their veggie of choice. Try adding a veggie you don’t usually eat to your grocery list this week — or change the way you use your favorite fruits and veggies, like adding strawberries to a spinach salad or blending kale into your breakfast smoothie. 7. Try a new protein. When you think of lean protein, chicken and fish may be the first foods that come to mind, but there are plenty of other healthy protein sources. If you need a change, skip the meat aisle this week and get your protein from eggs, quinoa, tofu, beans, cottage cheese, or yogurt. 8. Spice up your staples. There’s no reason to eat bland meals when you can usually add flavor without making a dent in your diet. “Almost all spices, peppers, and herbs are low-calorie, as are most vinegars, citrus zest, garlic, ginger, fish sauce, and even dry wine after it’s been cooked,” Dr. White says. 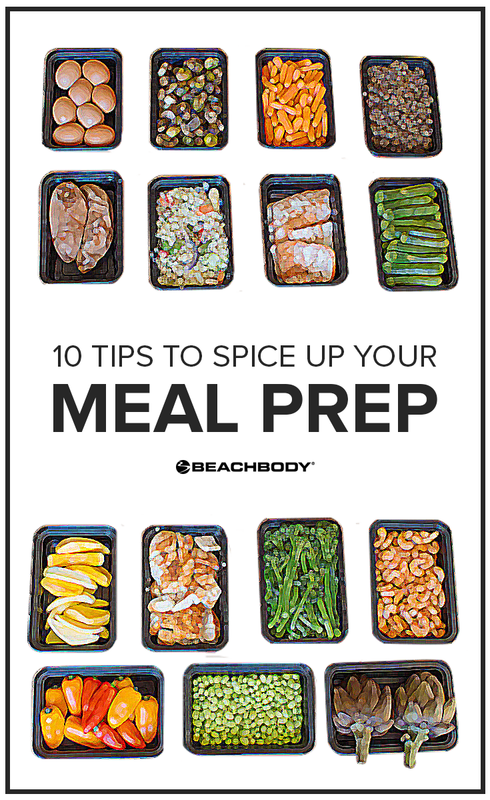 Get to know the spices in your pantry, and use them to keep your pre-prepped meals from getting monotonous. 10. Stock up on meal-prep containers.